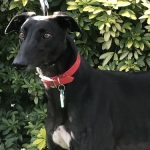 He is an average sized, very handsome, black, castrated male with a gentle and shy disposition. 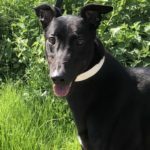 He takes his time to trust, but with gentle treatment the boy is a “cuddle bunny” and a leaner! Zulu was born in December 2007. He would best suit a quiet home without young children. 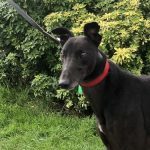 He’s shown us that he is more confident in the company of other dogs although he would be fine as an only pet in a quiet home. Zulu has met other breeds of dog and given us no cause for concern around those of medium to large breed. 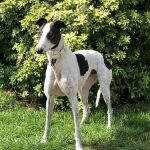 He’d still benefit from more all breed socialisation before he reliably accepts smaller breeds, but he has made huge progress in a short space of time. Zulu is able to negotiate stairs with ease. 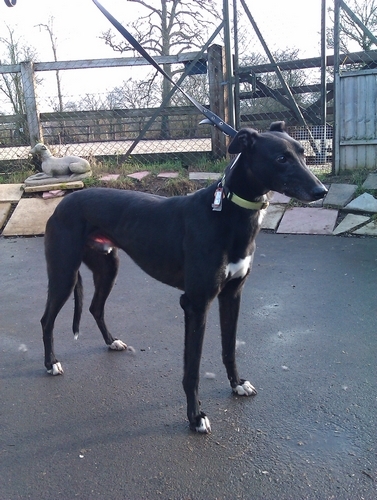 Following is a report from the Grant family who took Zulu for a day out of the kennels on 14.2.12. 11:15am. On arrival at Dodger’s home Zulu was introduced to Dodger in the garden, both dogs behaved perfectly and clearly liked each other. After this introduction Zulu went into the house and waited for Dodger to be prepared for a walk in the sunshine. 11:30am. Zulu and Dodger set off for a walk around Southwood Golf Course and surrounding roads. 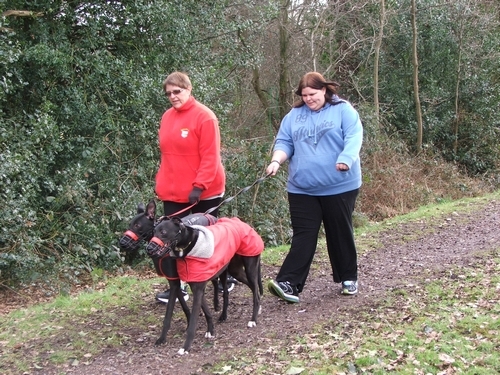 During the walk some loose dogs were encountered to which Dodger showed his usual keenness to want to play with them, being like a Kangaroo on a Bungee. Zulu was not at all interested and just walked calmly on his way. 12:15pm. Whilst returning home from the walk a man with a beard was encountered that Zulu clearly didn’t want to go near, although Dodger walked up to him for a fuss which he duly got. Upon arrival back at home Dodger went and ate his dinner and then it was time for a rest. 12:45pm. 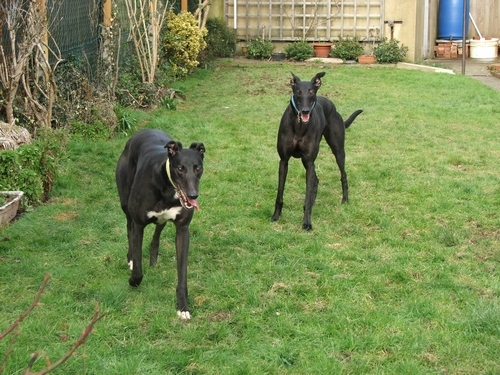 After resting it was time for shared loving then out into the garden for play. 13:30pm. Back indoors for Treat time after which Dodger lost his bed to Zulu. He did get it back later though he didn’t seem to care at all he was quite happy to share anything with Zulu. 14:30pm. More treats and indoor play and some watching out of the lounge window at anything passing by. 15:15pm. Yet more sleeping, that’s what Greyhounds are good at after all. 16:15pm. More shared loving, treats and play before Zulu had to get ready for his return and checks where the car is. 17:00pm. It’s goodbye to Dodger then into the car ready to go. 17:35pm. 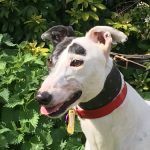 Arrive back at the Kennels and into his kennel again with thanks for a wonderful day out with Dodger. Zulu showed himself to be a well mannered calm dog that was certainly sociable towards Dodger. 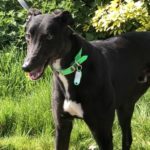 Although nervous at first once his trust has been gained he would take treats from you and come up for some affection. He certainly appears not to like men with beards. When out walking he was nice to walk on a Greyhound collar, no pulling even when loose dogs were encountered and he did not show any inclination to chase anything. Zulu travels well in a car and shows a willingness to get in and out of a car in a controlled manner. Zulu also experienced the sound of a washing machine, tumble dryer and a telephone ringing with no sign of distress. He also negotiated the 5 steps up to the front door without any trouble. He was also clean in the house, toileting appropriately in the garden or when out on a walk. He can also be a playful chap when motivated. Once Zulu had settled down on arrival he did make himself at home sharing some of Dodger’s things, even his bed. He will make someone a wonderful pet provided he is given time to trust them. 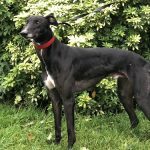 This entry was posted in Greyhounds Homed and tagged Black, Gentle, handsome, Homed, Shy by Marie.